"I love mangoes and fresh fruit. This is awesome to make and pack to have with you around town in a bottle, or just have for breakfast anytime." 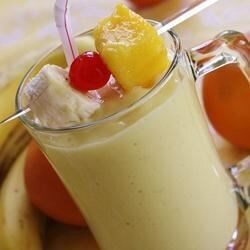 Combine the banana, mango, yogurt, and juice in a blender; blend until nearly smooth. This smoothie was refreshing and filling. I cut up a fresh mango and froze it for the mango pieces, which made the smoothie even sweeter. No sugar was needed, which is a healthful bonus. This is a great basic smoothie recipe. Good fresh taste that isn't too sweet. I also used orange juice since I didn't have orange-mango, and it tasted really good anyway. Great smoothie! The banana and yogurt make it so smooth and the mango flavor is really prominent. I also love that it doesn't require ice since it seems we never have any on hand. This was so creamy and thick like a milkshake. We had a few fresh mangos laying around to use up. I added almond milk and left out the OJ. I will definatly make this again. This is good. I didn't have the juice, so I used skim milk. I always add cottage cheese to make my smoothies creamy and I added protein powder.